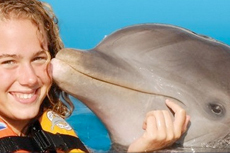 Receive a dolphin kiss, hug, or “fin” shake on an unforgettable dolphin swim through St. Thomas’ enclosed waters. After exiting the ship, we were escorted to a medium sized boat for an hour boat ride to Tortola. We took a boat to the island of Tortola and swam with the dolphins. We took a boat to the island of Tortola and swam with the dolphins. The staff for this excursion were extremely pleasant, knowledgeable and helpful. We truly enjoyed swimming with the dolphins and would recommend this excursion. Again, too long to get to. Again, too long to get to. 4 hour excursion and 30 minutes with dolphins......not worth the money! After a fun 1 hour speed boat ride to the island of Tortola (BVI) we enjoyed Dolphin Discovery - the tour was an excellent value, but you could not bring your own camera and the photography was expensive. The day excursion turned out to be less than an hour with the dophins. By far our favorite excursion of all time! By far our favorite excursion of all time! This was a dream come true!! I was brought to tears by these beautiful creatures!! Awesome experience! Everyone in my family loved this event! Really a once in a lifetime event. This was so much fun! It was really well organized and we bought a nice CD to keep our memories of this trip. This excursion takes you by ferry to Tortola, BVI and you must pass through customs on both legs of the ferry ride. Our first stop was St.
We took the dolphin swim excursion in St.
Had a fantastic time. The ride over to the Dolphin swim was great. We got to swim about an hour. We were very pleased that we booked this tour. This is an expensive tour, but well worth every penny spent.